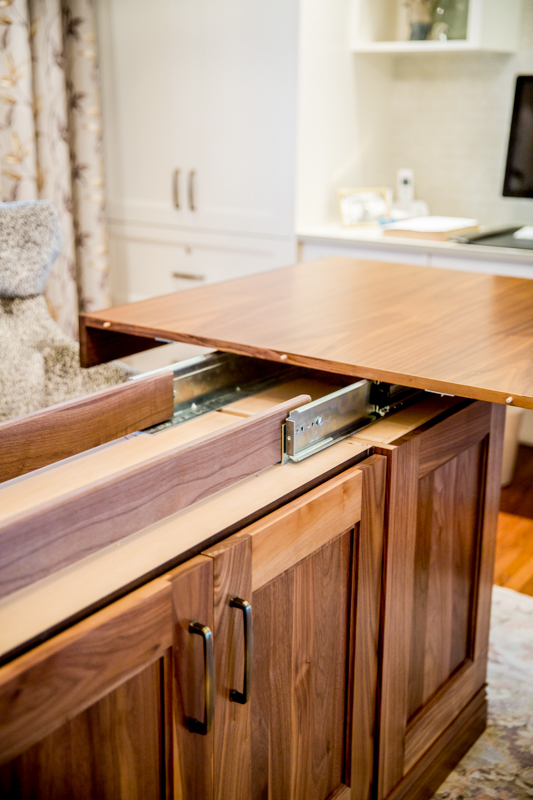 From custom draperies to benchmade cabinetry, we provide bespoke designs to bring your spaces refinement and beauty. 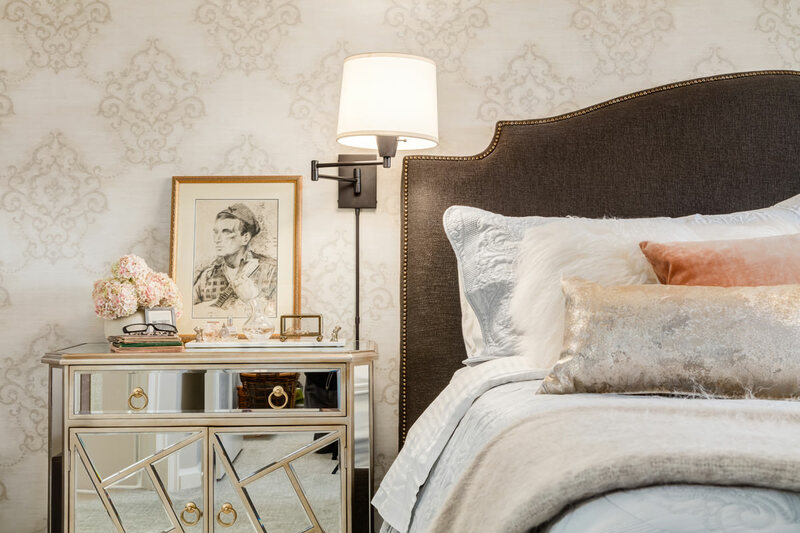 Every element in your space is carefully crafted to tell your story while providing comfort and function. 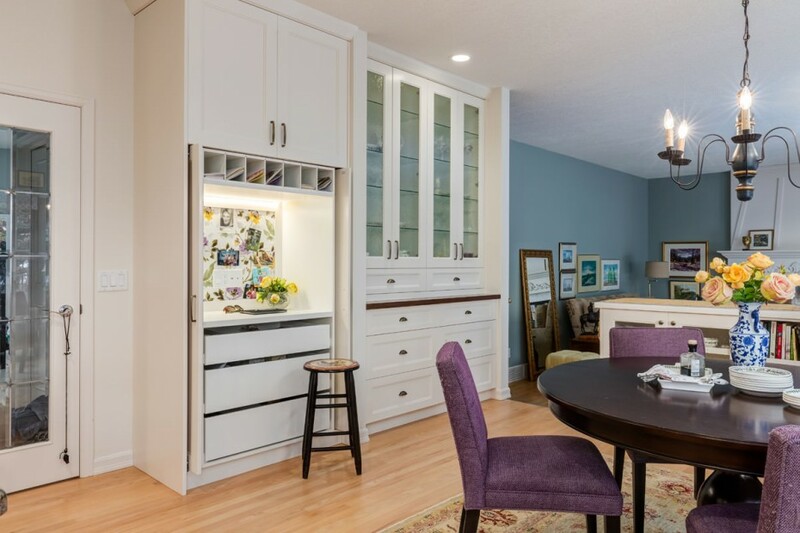 A wrap-around custom design shelving unit in the kitchen carries the room gracefully into the adjacent sitting area, outfitted with custom seating. 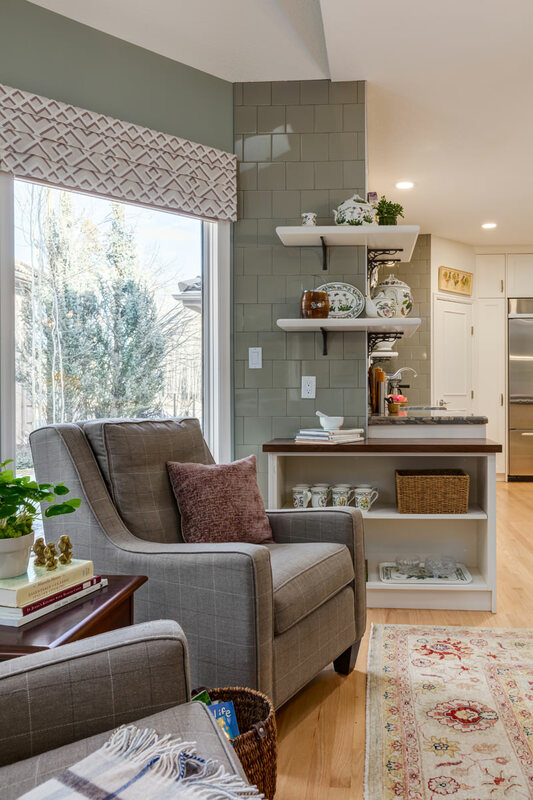 Charming upholstery and window treatments complement the full height glass tile backsplash we installed to update the kitchen. 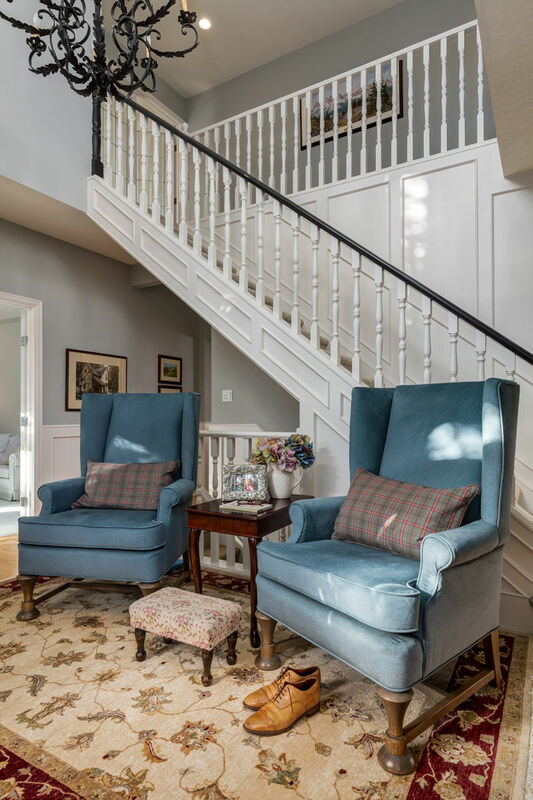 These gorgeous wing-back chairs were selected for the entry of a traditional home with a striking front staircase. 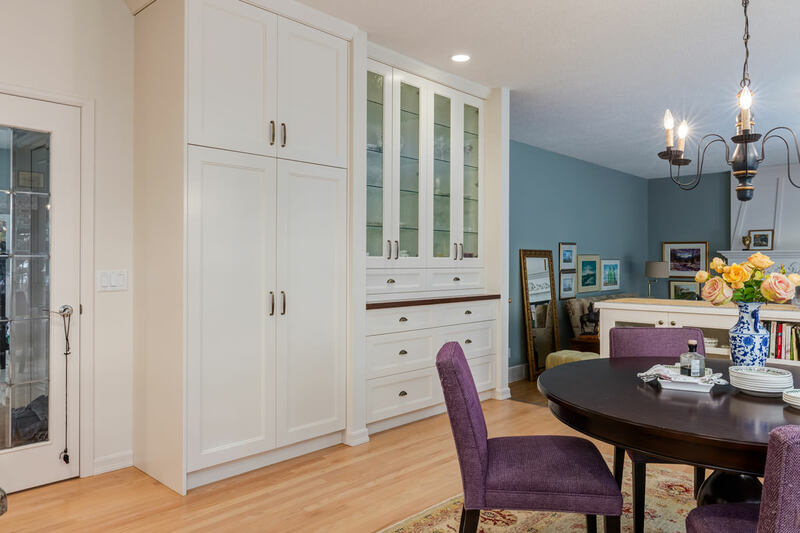 The custom upholstered blue chenille fabric adds colour and comfort, as well as durability for a high traffic area in the home. 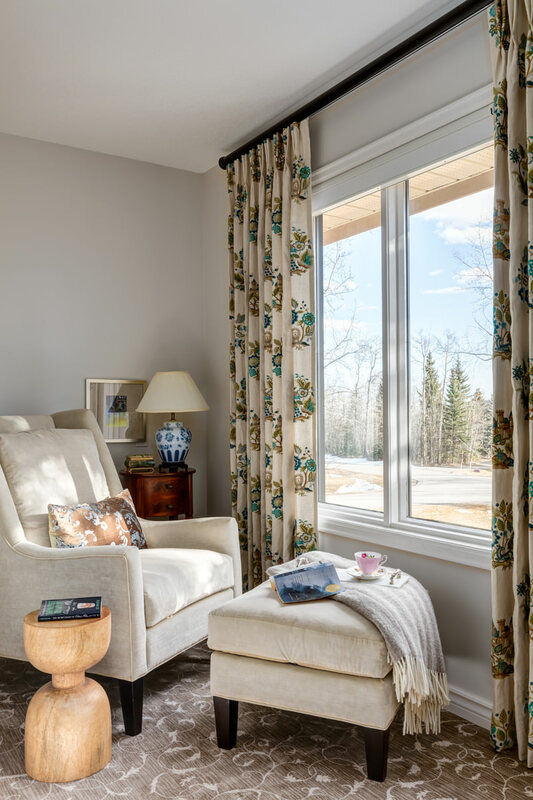 A corner reading nook in the main bedroom brings a cozy and comfortable hideaway in a grand estate home. The custom draperies in this space frame the gorgeous mountain view. 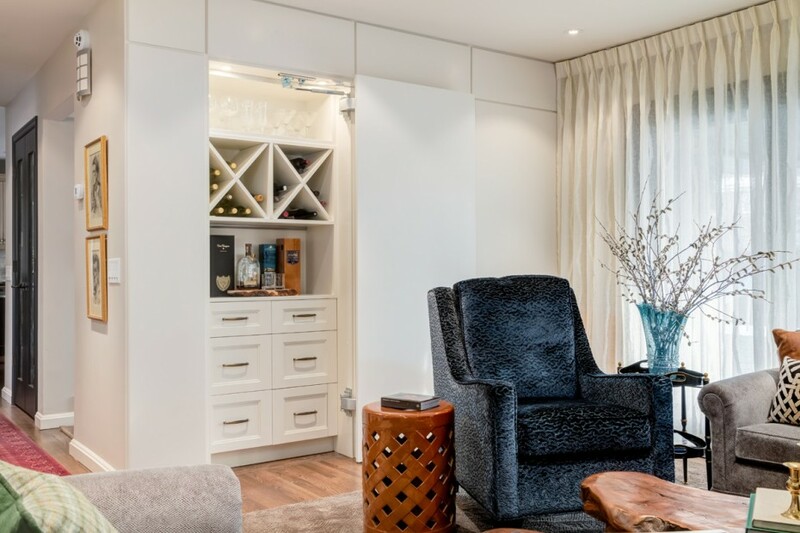 The lounge chair and ottoman were fitted to the homeowner and upholstered in an elegant and luxurious velvet. 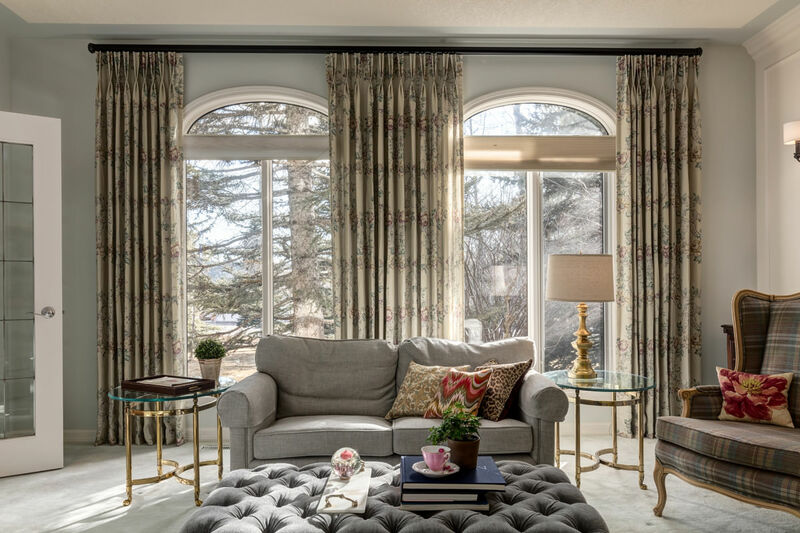 For this home’s formal living area, we selected a traditional roll-arm sofa and upholstered it in a fine jacquard fabric with a subtle pattern that complements the homeowner’s heirloom pieces. 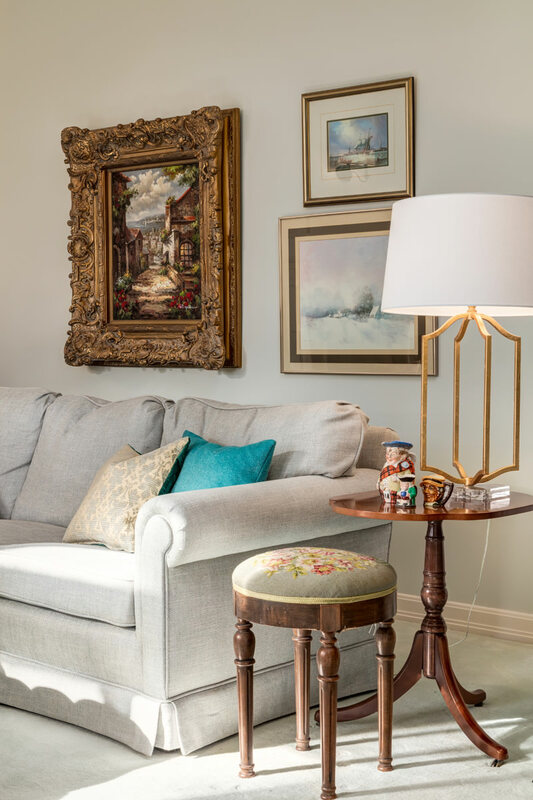 We designed custom frames for their art collection to truly do it justice. 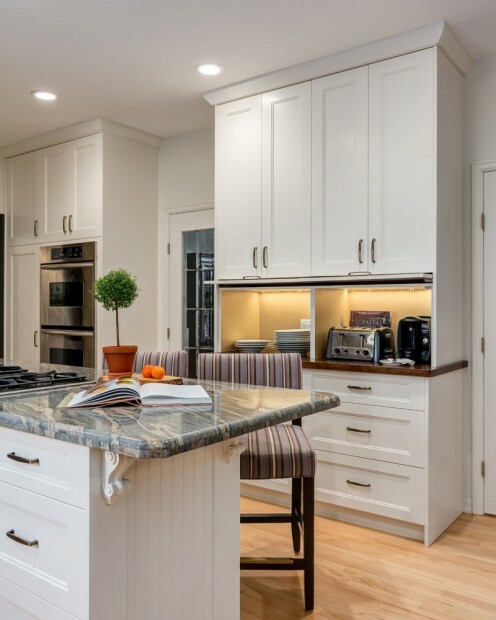 Our custom cabinetry installations are tailored to your daily life. 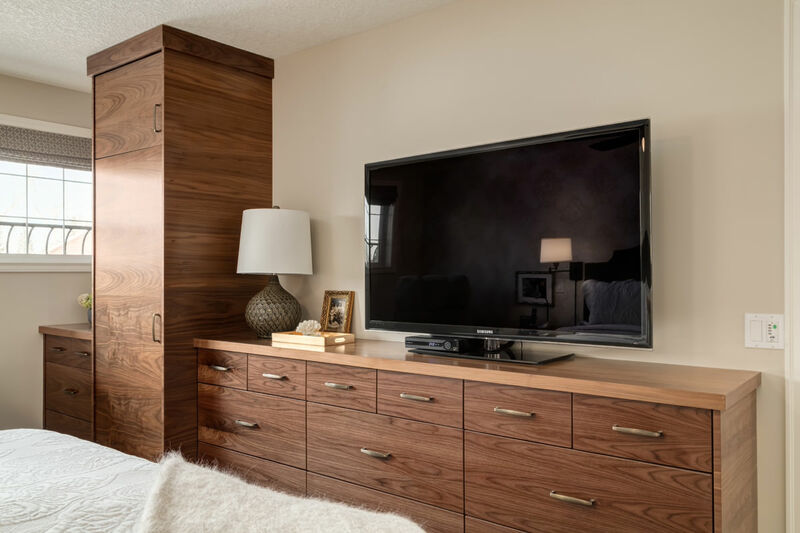 We use only the finest materials and partner with multi-generational artisans to craft solutions that look beautiful, provide storage and accessibility, and are built to last a lifetime. 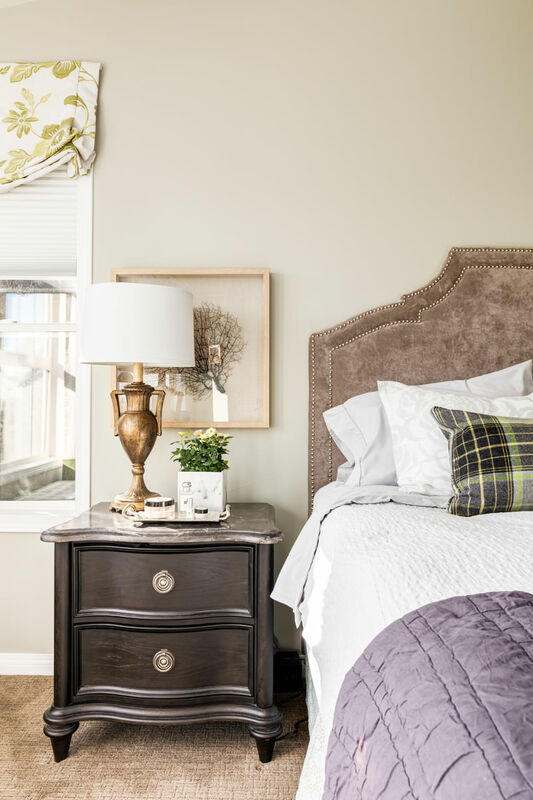 An elegant suede headboard with an exaggerated scoop perfectly completes this graceful bedroom, which was also fitted with custom window treatments in a bright lime floral pattern. One of our favourite custom installations was this graffiti art piece. 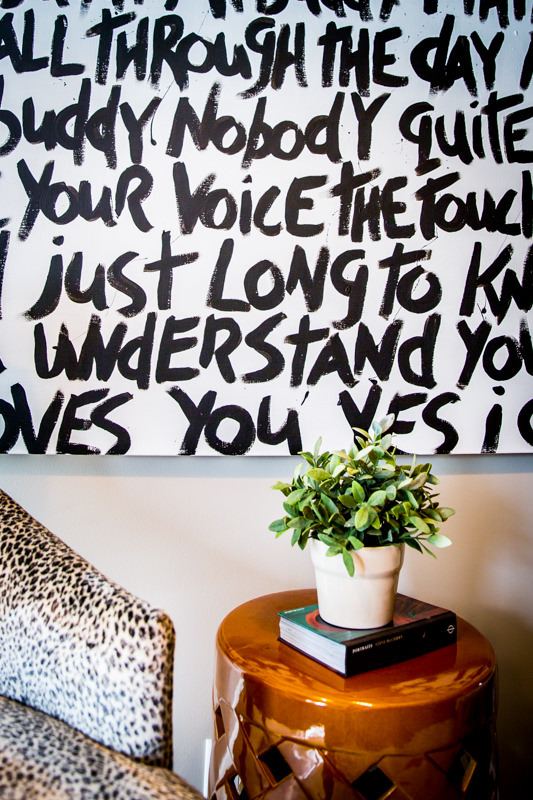 We commissioned this work with a local artist and incorporated the homeowners’ wedding vows. It’s an intensely personal and cherished keepsake that makes them smile each morning. Existing wallpaper was a challenge in this space. 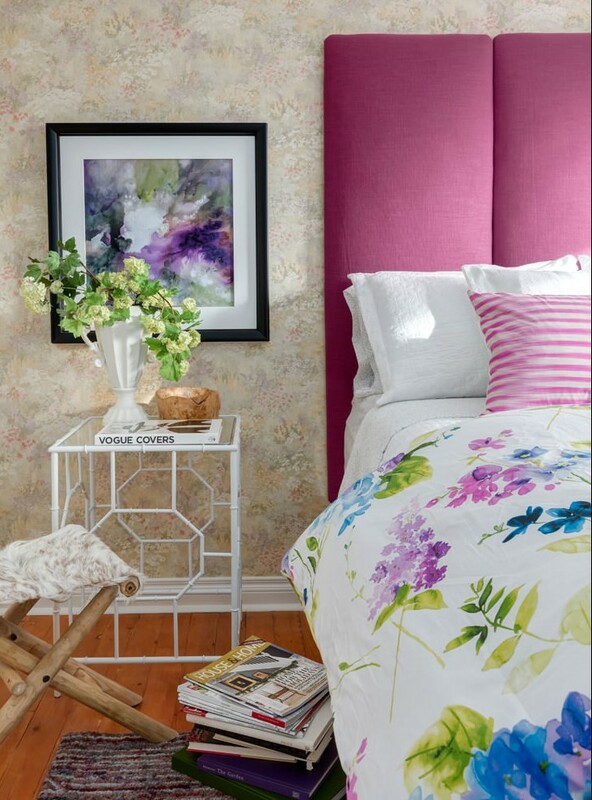 We addressed it with a bold custom headboard in an eye-catching, complementary pink. 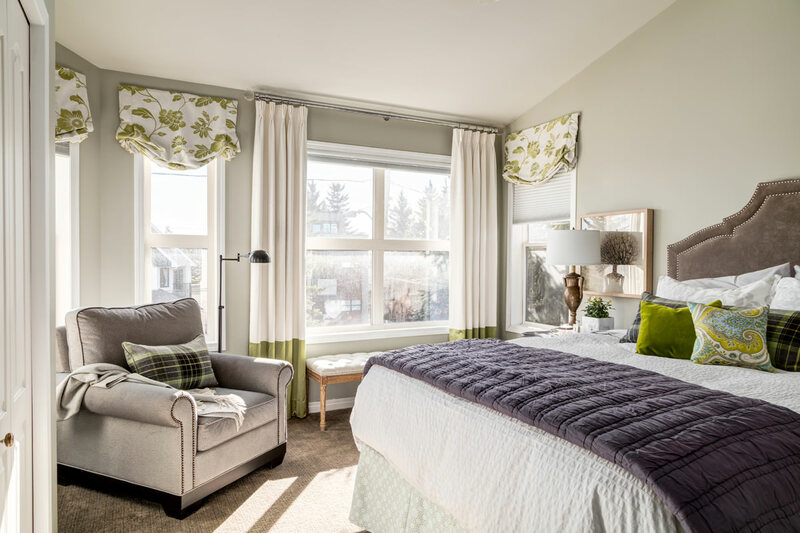 The result was a mod bedroom ready to receive overnight guests. 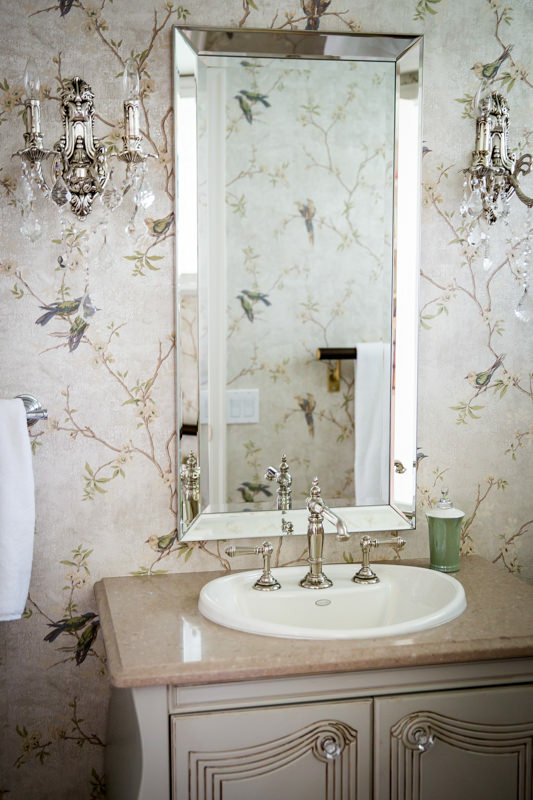 A powder room is a jewel in the crown of an estate home. We fitted this one with a delightful high-end wallpaper to make it truly memorable. 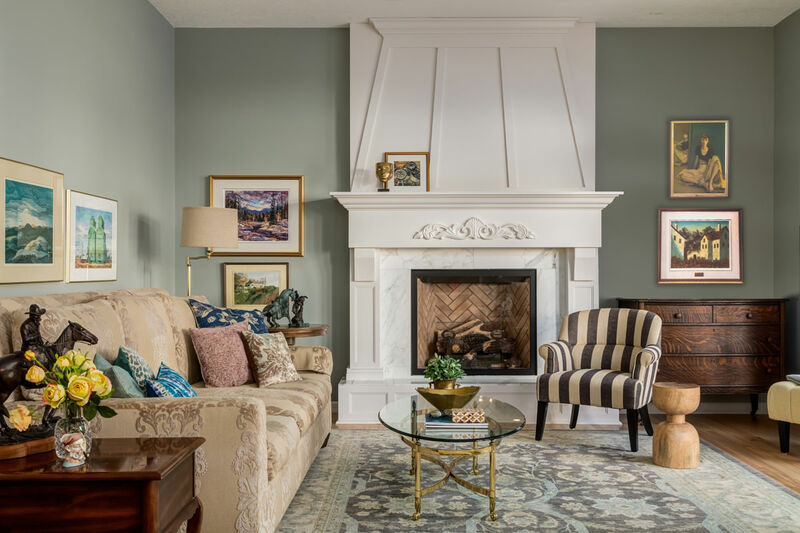 This fireplace was once a plain rectangular box. 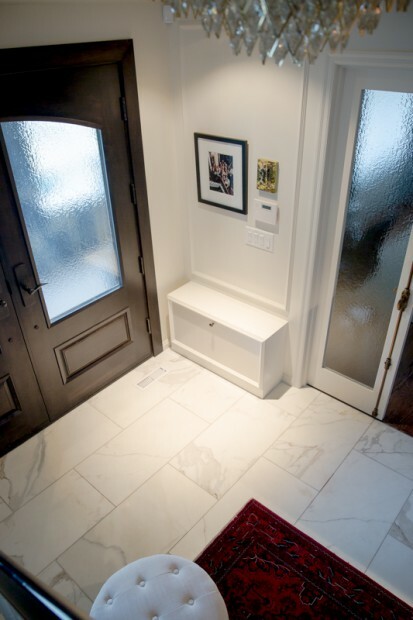 We transformed it into an English Country masterpiece with a custom built surround and gave the room presence. Comfort can be beautiful. We chose an adventurous deep blue to upholster this piece. 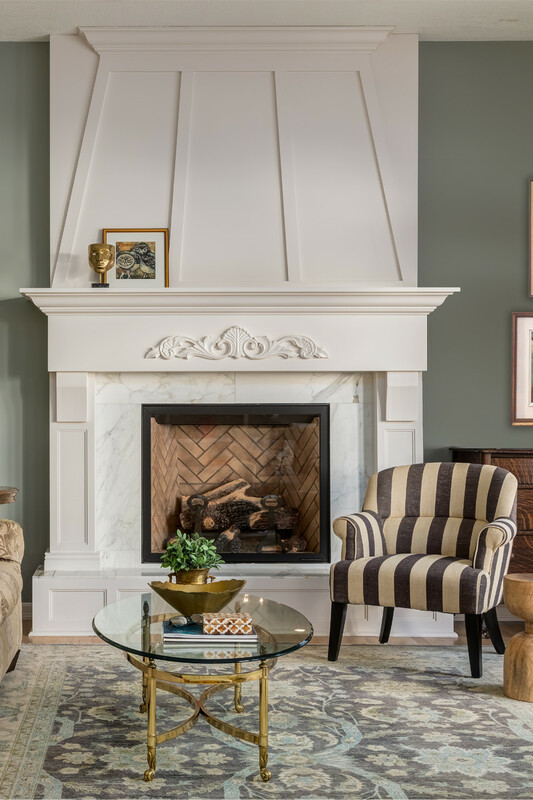 It perfectly offsets the other neutral pieces in the space and provides interest against the backdrop of a panelled wall. 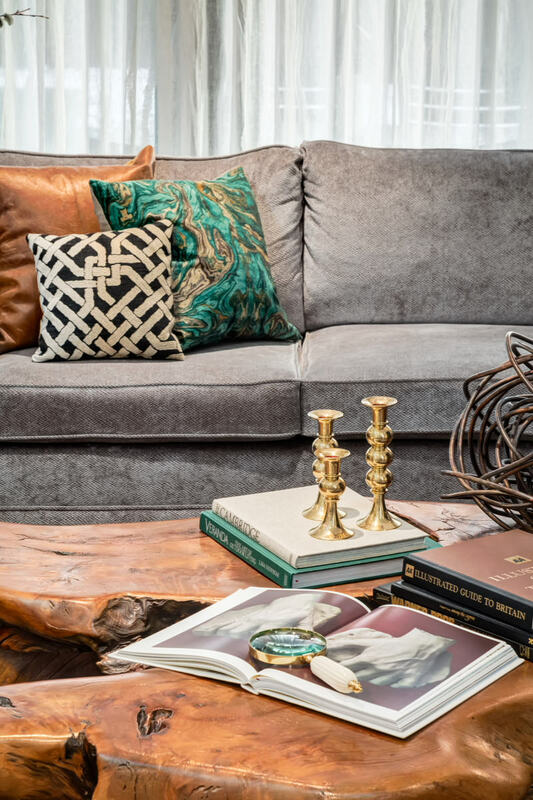 Bespoke pillows are a wonderful way to add colour and texture to timeless foundation pieces. We selected a fabulous peacock blue fabric to create the centrepiece pillow in this arrangement. 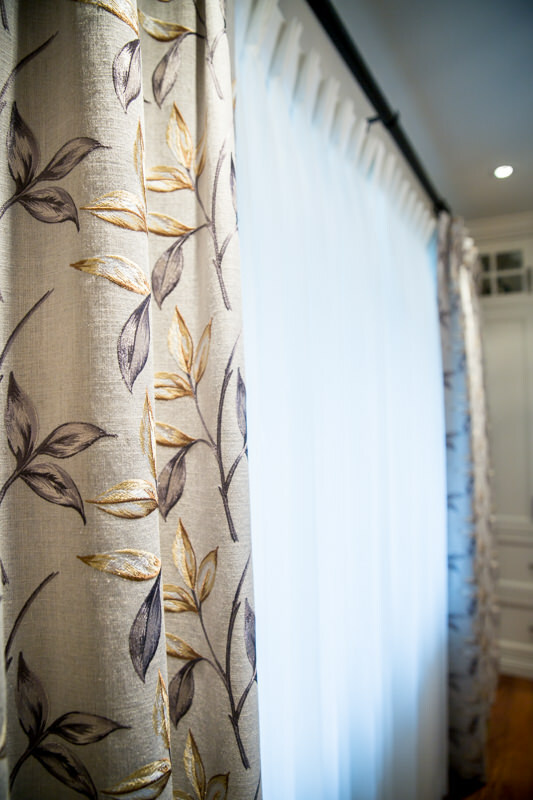 Custom draperies in high-end fabrics are a speciality of ours. 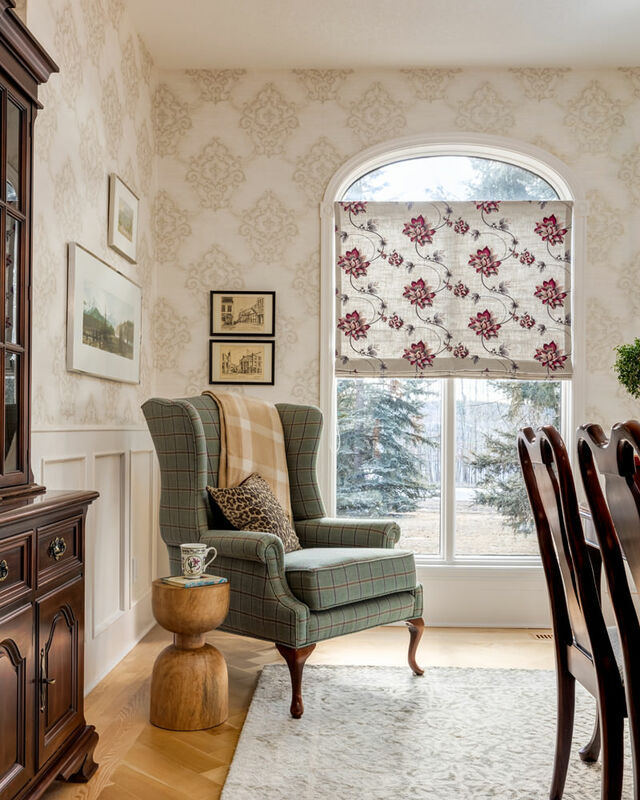 We select and craft window coverings to be the perfect accessory to any room. Each had their favourite chair, like an old glove. 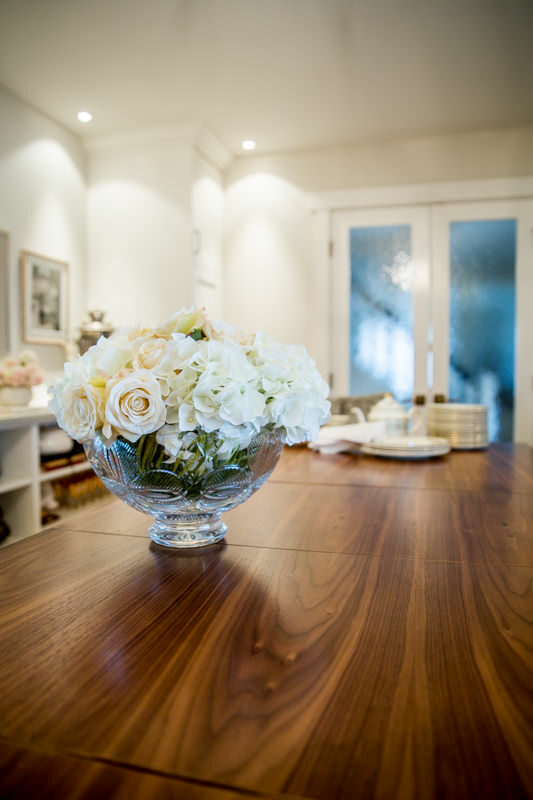 We created a morning room where they could start each day together. And we filled it with their favourite things, their favourite chairs, their books, their morning tea. 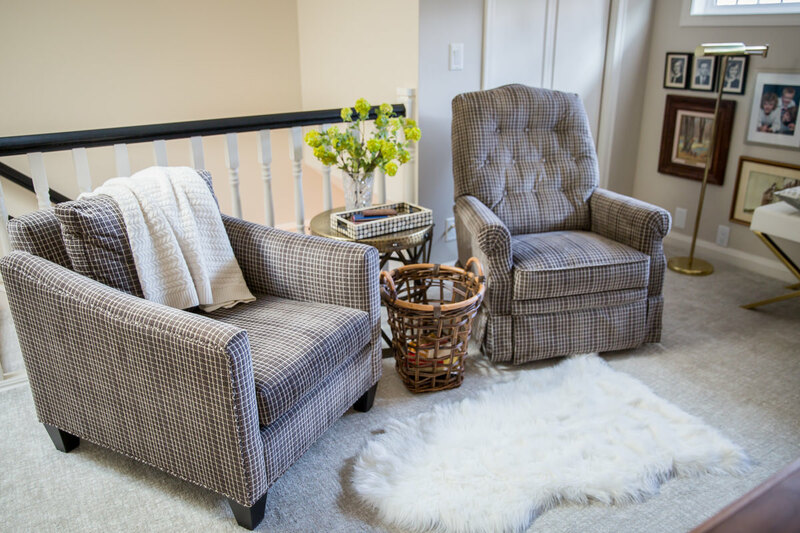 We had their chairs upholstered in the same casual chic fabric to tie it all together. 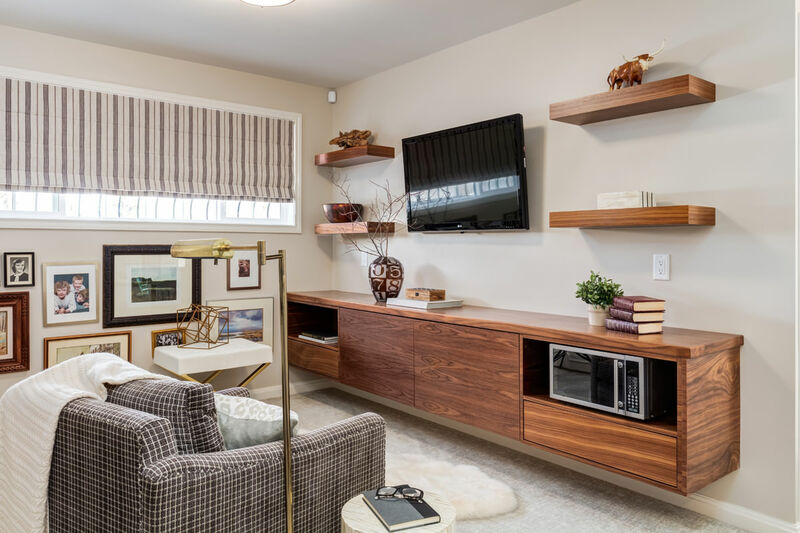 In the newly created morning room, we installed a custom designed floating console to house small appliances and supplies for the day’s first cup of tea. To greet them each day, open shelves above showcase their most treasured collectibles and memories. What place is good enough to house a lady’s fine evening wear? It’s an art collection in itself and deserves a safe and beautiful presentation space. 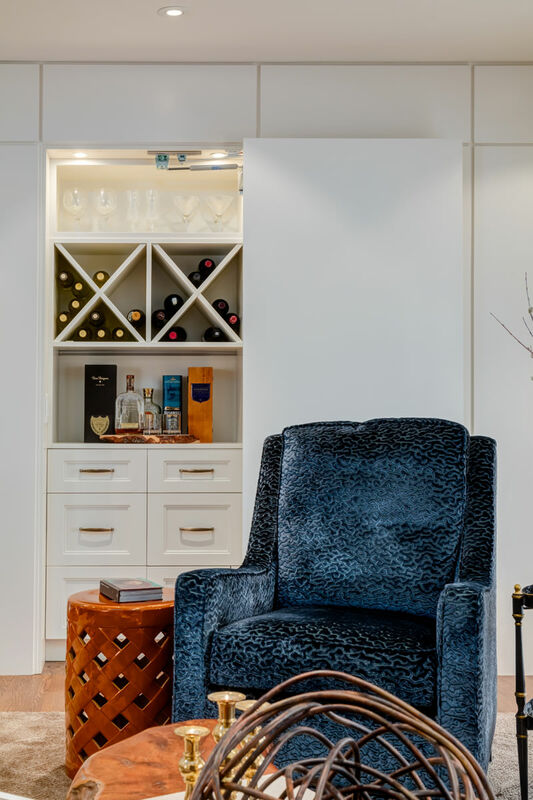 We designed and built a full-height dress cabinet exclusively for her collection, and integrated an indispensable full-length mirror into the design. 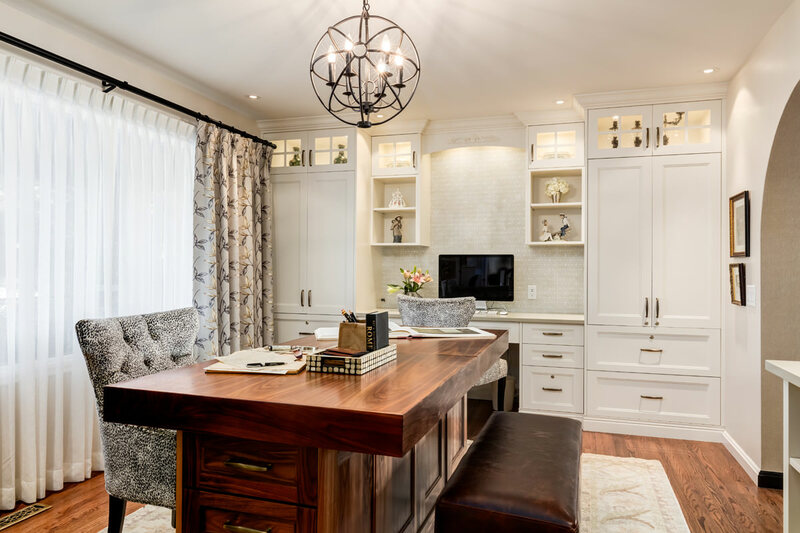 We designed and built this amazing custom walnut desk as a focal point to this home office. 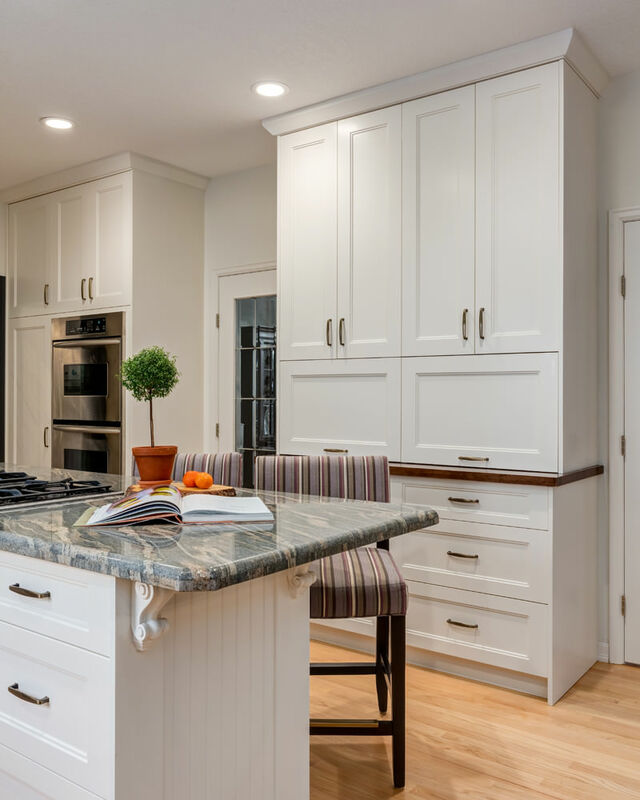 By day it anchors the homeowner’s business. By night? 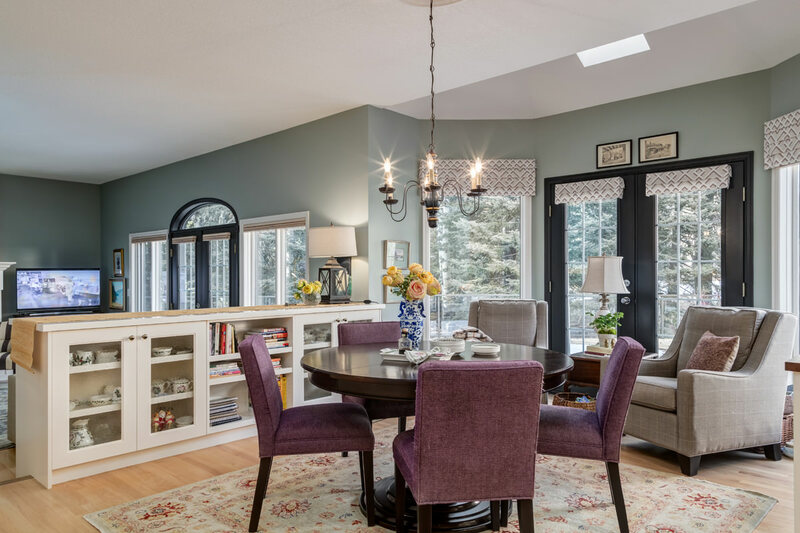 It transforms into a platform for fabulous dinner parties as extra space for dining. 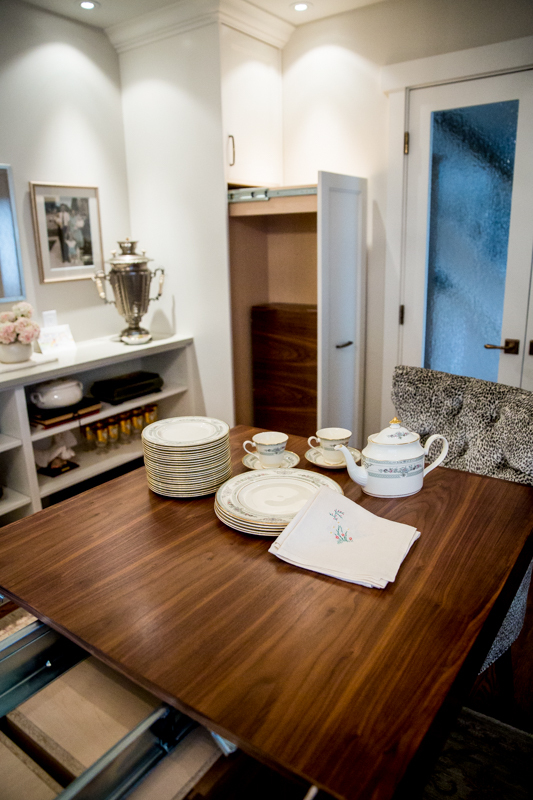 A custom sliding tall cabinet was integrated into the room’s built-ins to store the leaves and table pads when not in use. A place for everything. Our superior custom cabinetry solutions elegantly address any storage need that arises in your home, from shoe storage to fine china display. 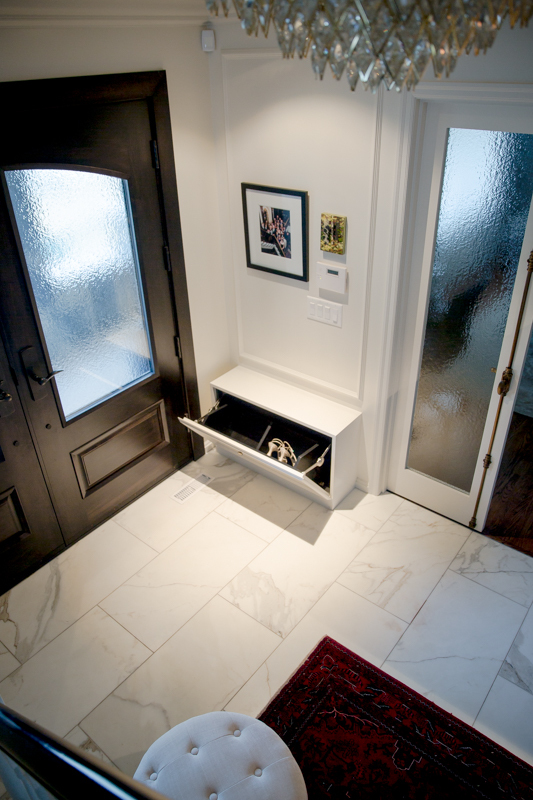 Exquisitely crafted, each installation becomes part of the foundation of your home.